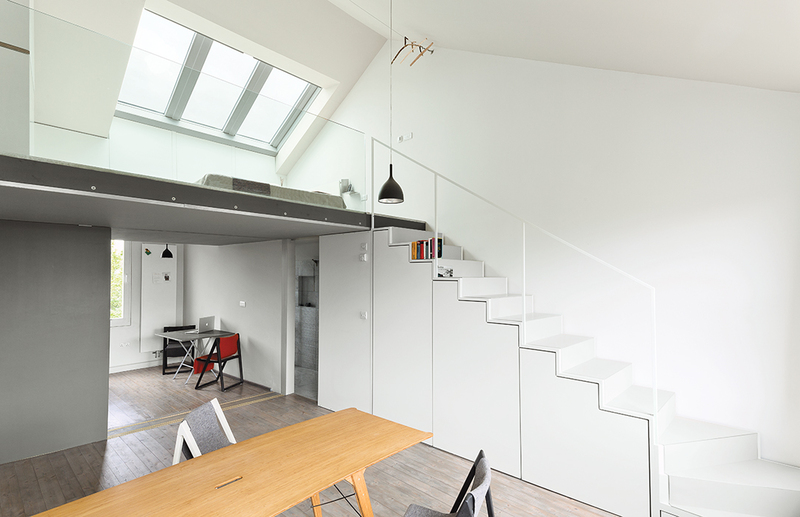 A minimal white staircase features built-in cabinets underneath for extra storage space in a small London flat. A streamlined elm staircase connects three levels of living space in this renovated Rome penthouse. In this La Jolla, California home, an industrial steel staircase conceals a pantry underneath. A grille of walnut slats delineates the stair from the living space in this renovated Toronto Tudor. This stair with oak treads is paired with a deeper wood accent wall to make a bold design statement in a modern Missouri lake house. Stairwells are the perfect place to display artwork; this Hamptons home features a series of Vik Muniz works that resemble Andy Warhol’s iconic portraits of Jacqueline Kennedy Onassis, but are made with ketchup. This metal-caged staircase adds visual intrigue to a modern Texas home; a shelf for books adds room for a pop of color. A stately concrete staircase is a new, grand addition to a renovated, 19th-century Brooklyn duplex.